In the preceding blog posting I started off this retrospective series about Lovecraftian tabletop RPG releases that came out in 2018. That posting provides the “helicopter-view” of the year’s releases, which is probably the place to look if you want a quick overview. The rest of this series will consist of more details about the 2018 releases. While there were literally dozens of Lovecraftian tabletop RPG products released in 2018, perhaps the best place to start is with the handful of “marquee” titles that stand out as major highlight achievements. This year, I can count three products or product lines that fit that bill: the Delta Green range, Chaosium’s new Masks of Nyarlathotep, and Pelgrane’s Yellow King RPG. It’s no secret that 2018 was a bumper year for Delta Green, Arc Dream’s modern-day Lovecraftian RPG of conspiracy/spy/military horror. When the Kickstarter for the standalone Delta Green RPG funded back in October 2015 I am sure that most people expected a good solid set of rules and a professional level of scenario support. I don’t think many would have expected the juggernaut of constant new releases that have emerged at a steady pace ever since. While it’s taken Arc Dream a couple of years to push the Delta Green core RPG through to a glossy two-hardcover printed set (in a nifty slipcase), 2018 is the year when that goal was finally achieved. It was also the year in which two of the Delta Green hardbacks were recognized at the ENnies, taking out a total of six awards. In previous years, the core ruleset for Delta Green had already been published in both quickstart form (Delta Green: Need to Know) and as the Delta Green Agent’s Handbook. There had also been some slim hardcopy publications of individual scenarios. 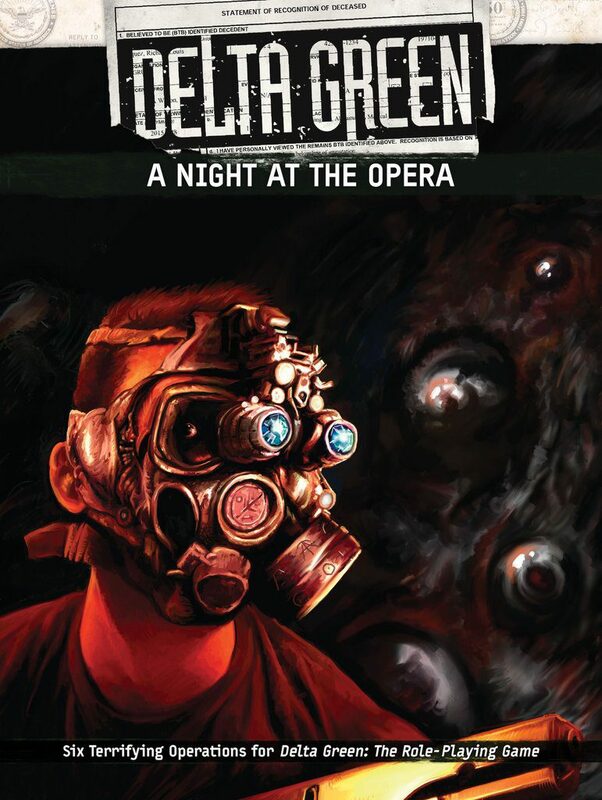 In 2018, the whole thing was brought together in a more serious way through two hardback print publications, the Delta Green Handler’s Guide (setting information, Mythos creature stats, spells, etc) and A Night At The Opera (a hardback scenario anthology collecting and reprinting many of the same scenarios previously printed individually). Arc Dream also released a slipcase set including both the Agent’s Handbook and the Handler’s Guide under the title Delta Green: The RPG. All of these titles were well received. A Night At The Opera won the 2018 Gold ENnie for Best Electronic Book and the Silver ENnie for Best Adventure. The slipcase set won two Gold ENnies (Best Rules and Best Production Values) and two Silvers ENnies (Best Game and Product of the Year). This was by far the best awarded Lovecraftian product range in 2018. One of the more curious additional items also to emerge during 2018 was a further book that was unlocked as part of the original Delta Green Kickstarter … but published by a different company entirely and using a different rules system. 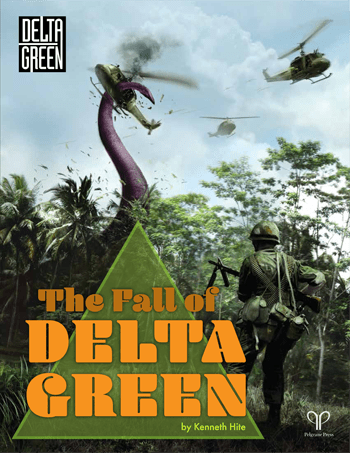 That product was The Fall of Delta Green, written by industry heavyweight Kenneth Hite. The concept for this book is that it is set during an unusual era – the 1960s – during a point in the Delta Green chronology when the titular secret organisation is in the process of unravelling alongside the covert undercurrents of the Vietnam War. This book was created and produced by Pelgrane Press and utilizes the same Gumshoe system found in some of their previous Lovecraftian (and other) games including Trail of Cthulhu – although notably Fall is not a Trail of Cthulhu title. The Fall of Delta Green is actually a self-contained game system in its own right containing everything you’d need to run 1960s military-spy-themed games with ties to the Delta Green chronology and universe. It’s an oddity to be sure, being the intersection of a couple of different spheres … but it’s also a gorgeously illustrated product and for all its quirkiness the book does deliver what it says on the tin. For Delta Green fans, there are even conversion notes on adapting the material to work with Arc Dream’s system. As well as all those big heavy hardcover books, there were also some smaller releases to round out the Delta Green cavalcade for 2018. These include an anthology of short fiction pieces by Dennis Detwiller (The Way It Went Down), a new version of the scenario The Last Equation, and updated second chapter of the serial campaign Future/Perfect. There may even have been other small products as well – to be honest the sheer pace of releases has been quite hard to keep up with even for diehard Delta Green fans. Doubtless buoyed by the success of all of these publication efforts, Arc Dream ran a second successful Delta Green Kickstarter in 2018 for a core product called Delta Green: The Labyrinth. The most exciting part of that campaign is the news that the legendary John Scott Tynes has been lured back to write the core book and some of the other items unlocked as stretch goals. Folks who remember as far back as the early days of Delta Green and Pagan Publishing will doubtless remember John as one of the key pillars of the early writing teams, and also one of the great scenario writers for the Lovecraftian form (well in my opinion, anyway). I’m sure a lot of people will be looking forward to some of the outputs from that Kickstarter materializing in 2019 and beyond. Virtually everyone who has ever played Call of Cthulhu will have heard of Masks of Nyarlathotep. First published in 1984, Masks is a globe-trotting campaign that in many ways defined and cemented the stereotypical form of Call of Cthulhu campaigns. It’s also one of the most widely-acclaimed tabletop roleplaying products of all time. For all these reasons and more, it should not come as a surprise to anyone that fresh off the success of its conversion of the classic Horror on the Orient Express to the most recent (7th Edition) ruleset, Chaosium would set its sights on a similar revamp of Masks. In 2018 this re-mastering of Call of Cthulhu’s “greatest hit” was the flagship product for the company’s Lovecraftian line-up. Rather than simply reprinting the venerable campaign – which has already gone through four editions, some with substantial additions – line editor Mike Mason chose to do some more in-depth tinkering to try to resolve some of the points that had proven divisive about the Masks backstory. The product of all this work is a massive brick of a slipcase set, comprising some 670-pages split over two hardback full-colour books plus a 96-page loose-leaf collection of handouts and maps. To say that the campaign has been given the “deluxe” treatment is probably an understatement – the finished slipcase set feels more like a “no expenses spared” production. Doubtless, true fans of the campaign will find this very much to their liking – although the lavish production has left the product with a rather hefty price-tag, and it also had a massively disruptive effect on Chaosium’s overall output for 2018 (chewing up the majority of production resources for most of the year). For those who have read any of Chaosium’s recent hardback releases and who are also familiar with previous editions of Masks of Nyarlathotep will probably find this new version is exactly what they would expect/hope it to be. It has all the production values and glossy full-colour interior trade dress that have now been a staple of Call of Cthulhu releases for a couple of years. In terms of content, the new edition does include some items that are brand new – most notably an all-new prequel chapter (set in Peru) which allows investigators to meet Jackson Elias well ahead of the events which see him deceased at the beginning of the main Masks campaign. That new chapter was written by Scott Dorward. Also new to this edition are scatterings of notes to help a Keeper run the campaign using Pulp Cthulhu – this is an interesting proposition: since Masks is already a campaign which owes as much to Indiana Jones as it does to HPL, one wonders exactly how “over-the-top” it might veer when the Investigators are Pulpy powerhouses. I guess it’s an interesting option to have, nonetheless. While it is tempting to look at the sheer bulk of the new Masks slipcase and assume that since it is well over twice the page-count of the previous (4th) edition there must be oodles of new game content – that might be a slightly flawed assumption. Yes, there are a lot more pages, but the new Chaosium trade dress tends to fit less content on each page plus the new edition is much much more lavish when it comes to interior illustration. All of this makes for a nicer final product, but at the game table may not much alter the way the campaign plays out. One thing that is greatly beefed-up is the quality and quantity of player handouts. This is thanks to the involvement of the H.P. Lovecraft Historical Society (and in particular Andrew Leman). Those guys are literally the best Lovecraft prop-makers on the planet, so having them involved was a major win for Chaosium. In addition to designing many of the handouts that went into the core product, the HPLHS folk also crafted several tiers of deluxe prop kits which can be ordered direct from them. Also, there is an audioplay adaptation of Masks of Nyarlathotep created as part of the HPLHS’s amazing Dark Adventure Radio Theater — certain of their prop kits also tie in to that recording. The Chaosium revision of a classic fan-favourite like Masks of Nyarlathotep was never going to happen without its critics, and a few minor problems and issues were raised as a result of some of the “in progress” content shared by Chaosium for promotional purposes. The biggest of these – which was subsequently remediated to an extent by Chaosium – related to some of the artwork commissioned for the campaign. These “epic horror” pieces veered strongly into stylistic territory more closely reminiscent of a Pathfinder horror supplement than something for Call of Cthulhu, which seemed to bother some old-school fans. Smaller concern were voiced around the editorial reworking of some of the details of the original campaign, in particular making Jackson Elias unequivocally African-American (instead of vaguely hinting as much). Another gripe voiced by a few people is the rather conscious decision taken during the revision to somewhat ignore the massive body of work that went into the fan-community-written Masks of Nyarlathotep Companion (which now is partially out-of-step with the as-published campaign). All of these quibbles, however were small blips on the radar and overall fan reaction to the new edition has been quite positive. Pelgrane Press have established themselves in recent years as a mid-sized publisher that isn’t afraid to take on some absolutely massive honking projects, and largely deliver them on time. A couple of years back their Dracula Dossier product (line) for Night’s Black Agents was a modest Kickstarter which escalated into something bigger than Ben Hur. Their current Kickstarter – for Robin D. Laws’ Yellow King RPG seems somewhat cut from a similar cloth, aiming as it does to create a brand-new RPG with not one but four variant historical settings, each of them a wildly different take on the King in Yellow mythology of Robert W. Chambers. Strictly speaking, the weird fiction of Robert Chambers is not part of the standard Cthulhu Mythos cycle of stories, but it’s been so closely rolled into virtually every Lovecraftian RPG that I think it’s reasonable to consider it, if not precisely “Lovecraftian” then at least a near neighbour. Pelgrane’s Kickstarter for the Yellow King RPG funded in July 2017 but had an estimated fulfilment date of December 2018. This is a long lead time for a gaming project (which may have put off some), but it has proven a fairly accurate schedule – the final PDFs for all parts of the game being delivered in early December. Printed versions of the books are still pending. Trying to describe the Yellow King RPG is not an easy task. On one level it’s easy to understand: it’s yet another Gumshoe-based game of weird investigation. It’s the style of investigative settings and adversaries that makes it something quite unique. Whereas pretty much all existing investigative Lovecraftian games have aimed to set their tales of dark cosmic horror in a recognizable historical or current real-world setting, the Yellow King RPG revels instead on putting players into slightly surreal worlds where normal history has been subverted by the influences of the King in Yellow. If you’ve ever read the original cycle of four “King in Yellow” stories by Chambers, you’ll probably recall how they seem to be set in slightly unsettling versions of the present or near future (e.g., a version of America where there is a Royal family and suicide booths on street corners). The core concept is that the influence of the King in Yellow (the entity, the play, both) is corrosive to normality and causes weird decadence to seep in and warp reality. Thus, in the first book of the Yellow King RPG, players take on the roles of art students in a warped version of 1890’s Paris. Amid the fin-de-siecle decadence of the “yellow decade” they can run into manifestations which hint that things are not as they should be. The publication of a play called “The King in Yellow” has started to overwrite reality with an alien world called Carcosa. The second book in the Yellow King RPG set (titled The Wars) presents an entirely different set-up but one that is equally warped from established history – it is a version of 1947 where World War 2 has been extended by the alien influences of the Yellow King. Players take on the roles of soldiers fighting on these battlefields of shattered Europe investigating instances of weird supernatural manifestations. Books Three and Four (Aftermath and This is Normal Now, respectively) provide two different “modern day” types of setting – or rather, places and times which are “twilight zone”-similar to reality as we know it. But in different ways. In Aftermath, the players take on the roles of survivors of the Continental War from Book Two, now living in the 2010s … but the devastating influence of the wars means that “modern day” America is a kind of brutalist totalitarian state where propaganda and society has a more 1950s bent and technology has languished in the 1980s. Conversely, This is Normal Now presents a world that seems on the surface like it is our familiar “real world” of the 2010s (or whenever the game is played) but weirdness and dark secrets lurk not far below – the discovery of which will expose the truth that this world is really nothing like the world we know. In addition to the main four books which make up the Yellow King RPG there are two additional books unlocked during the Kickstarter – one is a book of fiction, while the other is a large “in world” game prop for the 1890s Paris setting. I can’t really comment much on either of those (since I haven’t read the fiction and was involved heavily in the creation of the prop). In addition to putting out the brick-sized revised Masks of Nyarlathotep, Chaosium did also have a modest output of other Call of Cthulhu titles in 2018. Most of these were released towards the end of the year, after Masks had made it out to release. The Call of Cthulhu Starter Set: Despite the fact that Call of Cthulhu has existed for some 36 years, one thing It has never had is a kit specifically designed to introduce new players to the game. With the resurgence of tabletop roleplaying more generally (thanks mostly to renewed interest in D&D 5e bringing new players or bringing back old players) the idea of a “starter set” seems to be on the minds of many publishers. Late in 2018 Chaosium released their boxed Call of Cthulhu Starter Set to some fanfare. Inside the attractive box are four slim books, a set of dice, and a handful of loose character sheets (five of them printed with an assortment of suitably diverse pre-generated investigators). The first book is a revised version of the solo scenario “Alone Against the Flames” (which has been a free download previously). The second booklet includes a cut-down version of the Call of Cthulhu 7th edition rules, fitting the whole process of Investigator creation, skill system, combat, and sanity into 24 pages! The largest of the books is Book 3: Scenarios which includes three full scenarios reprinted and revised from previous sources. These are “Paper Chase”, “Edge of Darkness”, and “Dead Man Stomp”. The most notable of these is Dead Man Stomp which has been augmented with some new material about race and racism courtesy of Chris Spivey (author of Harlem Unbound). Terror Australis, Revised Edition: In the early days of Call of Cthulhu’s publication history, Penny Love and Mark Morrison wrote a sourcebook for 1920s Australia. Long out of print, that book was called Terror Australis. After decades, Chaosium have revamped this material … or, more accurately, rewritten most of it from scratch. This revised edition of Terror Australis isn’t something I can independently comment on too much since it has my personal fingerprints all over it. But I can say that its depiction of the 1920s Australian setting is vastly more detailed than what was possible in the modest page count afforded to the 1980s original. The systems and depictions surrounding Aboriginal Dreamlines and the like have also been radically overhauled, hopefully to be more sympathetic to the real-world belief systems of living Aboriginal cultures. Finally, the two scenarios in the book are both brand new. Scritch Scratch (Free RPG Day 2018): For the last two or three years Chaosium has participated in Free RPG Day, offering small original titles to be sent to bricks and mortar stores to be given away to customers on Free RPG Day in June. This year, Chaosium’s title was a single-scenario book called Scritch Scratch written by Lynne Hardy. It is a modern-day scenario set in rural England and draws upon some real-world folk beliefs. While the title was primarily for Free RPG Day, it is also available as a free PDF download direct from Chaosium, or as a Print On Demand physical book via Lulu. This entry was posted on Monday, January 28th, 2019 at 9:21 am	and posted in News & Updates. You can follow any responses to this entry through the RSS 2.0 feed. You don’t (yet) know the half of it! In researching this retrospective I have ended up poking into obscure places that I had no idea existed. What can I say … Lovecraftian stuff has infected everything. It’s like a creeping doom.